With average daily temperatures in the high-80s (over 27 C), you may want to plan some time on your Orlando vacation to experience one of our refreshingly cool, amazingly fun water parks. With rides and attractions to appeal to everyone from your toddler to your teen - not to mention those of us who just want to feel like kids again – you’ll never have so much fun getting soaked! Creative themes make a visit to either of the two water parks at the Walt Disney World Resort memorable. What happens when a freak snowstorm hits Central Florida? Well, you build a ski resort, of course! 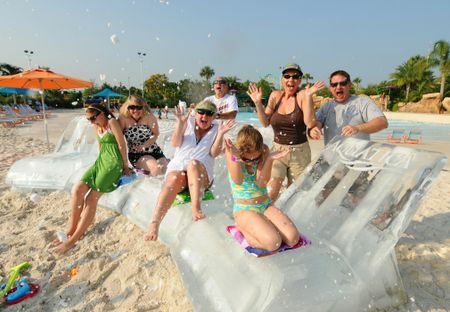 When the thaw comes, you’re left with Disney’s Blizzard Beach Water Park, a 66-acre water park where the only chills you’ll experience come from the slides and rides. For thrill seekers, take the chair lift to the top of the 90-foot, snow-capped Mt. Gushmore. Once at the top, you can choose your way down – the 55 mph plunge straight down from the 120-foot heights of the aptly named Summit Plummet or the tall, but less steep, Slush Gusher speed slide with a couple of surprise “moguls” to spice up the ride. Looking for a more relaxing way to cool off? Soak your cares away in Melt-Away Bay, a 1-acre pool at the base of Mt. Gushmore or hop in an inner tube to explore the icy caves of Cross Country Creek, which circles the park. Little ones will want to spend the whole day at Tike’s Peak, a scaled-down version of the park built especially for water adventurers under 48 in.tall. Disney’s Typhoon Lagoon Water Park was born in the aftermath of a mythical tropical typhoon. The centerpiece of the park is the Miss Tilly, a shrimp boat from Safen Sound, Fla., that was picked up by the strength of the typhoon and deposited precariously on the top of Mt. Mayday, 95 feet in the air. A nearby fruit packing plant, Tropical Amity, is the scene of frequent flash flooding which sends guests careening down the remains of the wash facility aboard inflatable rafts on Crush ‘n’ Gusher, a white-knuckle water coaster. In addition to thrilling slides and tube rides, you can come face-to-face with colorful underwater creatures during a snorkel adventure at Shark Reef, a 362,000-gallon saltwater pool, or body surf in the 2.25-million-gallon wave pool. Ketchakiddee Creek, complete with geysers, fountains, slides and a pint-sized white-water rafting adventure caters to the smallest members of your family. Both parks are open year-round. You can add the water park option to your customized “Magic Your Way” vacation package or check ticket price. A new edition from 2008 is Aquatica from SeaWorld, a combination of animal experiences, water rides and slides, high-speed thrills and relaxing sandy beaches and will appeal to all ages. The park is located on 59 acres of land, on the east side International Drive, south of Sea Harbor Drive near to the existing SeaWorld park. It is about one third the size of the original SeaWorld water theme park and about twice the size of Discovery Cove with visitor numbers expected to be limited to around 7,500 people. Wet ‘n Wild Orlando, voted America’s most visited water park by Amusement Business magazine, offers plenty of fun for the whole family at its park, conveniently located along International Drive. No trip to Wet ‘n Wild would be complete without experiencing its three newest rides – Brain Wash, Disco H2O and The Blast. You'll be challenged to control your thoughts as you spin through the giant Brain Wash funnel, with lights and images flashing around you. Disco is alive and well and you can experience the sounds of the seventies as you are sent spinning through an enclosed aqua disco on Disco H2O. Or, get soaked to the bone as you travel down a ruptured pipeline on The Blast. A fun-filled kids’ zone will keep the little ones busy while a lazy river and 17,000-square-foot wave pool, complete with four-foot high waves will help you escape the heat. For your more adventurous family members, the Wake Zone offers kneeboarding, tubing and wakeboarding fun on a half-mile long lake. Wake Zone is open from May through September. A nominal fee applies to the “Wild One” tube ride. Wet ‘n Wild is open year-round with heated pools in the cooler months. If your Orlando vacation takes you further afield, you will want to plan a stop at these nearby water parks. Adventure Island, located adjacent to Busch Gardens Africa in Tampa Bay, is a 30-acre water park that combines high-speed thrills with a soothing Key West-inspired atmosphere. With names like Everglides, Gulf Scream and Key West Rapids, this park’s water rides are truly Florida-inspired. The Spike Zone, an 11-court championship white-sand volleyball complex hosts both professional tournaments and friendly amateur matches that you can either join in or sit back and watch. Fabian’s Funport ensures that the kids can enjoy a wave pool all their own. Adventure Island is open seasonally from March through October. Splash Island Water Park, at Cypress Gardens Adventure Park in Winter Haven, is located just an hour from Orlando. Splash Island offers refreshing relaxation in the cool, slow-moving waters of Paradise River; the twisting-and-turning excitement of the Tonga Tubes; the white-knuckle white-water raft excitement of The Storm Surge or the sudden drops of the Voodoo Plunge. Kowabunga Bay, the 20,000-square-foot wave pool and the child-inspired gentle water fun of the Tikki Garden, offer a spot to sit back and soak up the warm Florida sunshine. Cypress Gardens is open seasonally from July through October. Admission to Splash Island is included in general admission to Cypress Gardens. Take a break from the heat and soak up the fun at one of Orlando’s amazing water park experiences.